These paleo chocolate chip cookies are a deliciously guilt-free treat your whole family will love. 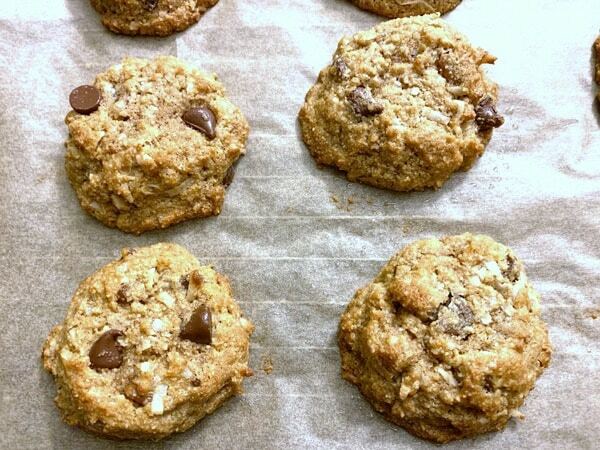 These cookies are made with almond flour, which adds a nice protein boost! Don’t tell the kids these cookies are healthy! That is our little secret :-). 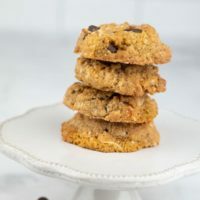 Before I get into how much I love this paleo chocolate chip cookie recipe, and why you will too, I need to tell you about the products I used to make this gluten free cookie recipe. I usually don’t start out a blog post like this but you all KNOW how expensive gluten free products are. It is one of the biggest downsides to gluten free living! Cookie lovers need to look no further than my favorite grocery store, Raley’s (aka Nob Hill Foods in my area). Raley’s Private Label Foods Help You Save Money! Well, Raley’s has helped us out with this problem with their new private label foods! High-quality foods, even tons of organic foods, at a fraction of the cost of name brands! Raley’s private label foods are everyday products that you use all of the time! And check out that price on the Organic Cage Free Eggs! Most brands of organic eggs are double the cost! It just got less expensive to do my weekly grocery shopping! 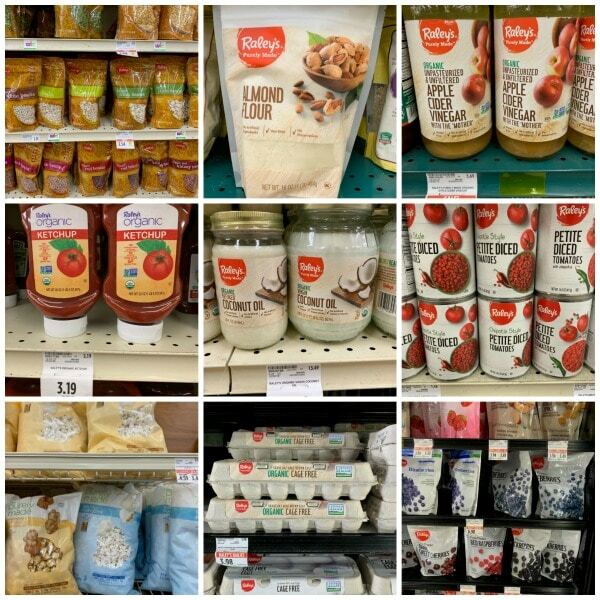 I know you have heard me gush about Raley’s Shelf Guide and how it makes it so much easier to find gluten free foods (and healthier options.) Think of Raley’s Shelf Guide as your personal wellness tool every time you shop. 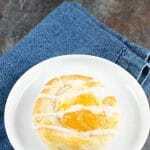 You can read more about their shelf guide and give these delicious Egg Muffin Cups a try :-). Raley’s private label products come with three different labels. Raley’s Brand, Raley’s Purely Made, and Nob Hill Trading Co. Raley’s Purely Made are made with clean ingredients and a lot of wholesome flavors while Nob Hill Trading Co. is more gourmet with lots of specialty items like vanilla and spices. 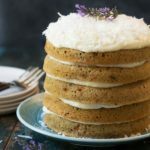 I prefer almond flour to an almond meal because almond flours are finely ground leaving very little texture to baking. Almond meal is more course, and it absorbs liquids a little differently because of this. 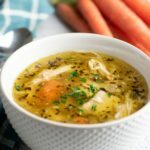 For this recipe, I played the super sneaky mom. Almond flour is one of my very favorite ways to add protein in the desserts and sweets that I bake. It helps prevent that sugar buzz kids seem to get when they eat too many cookies! 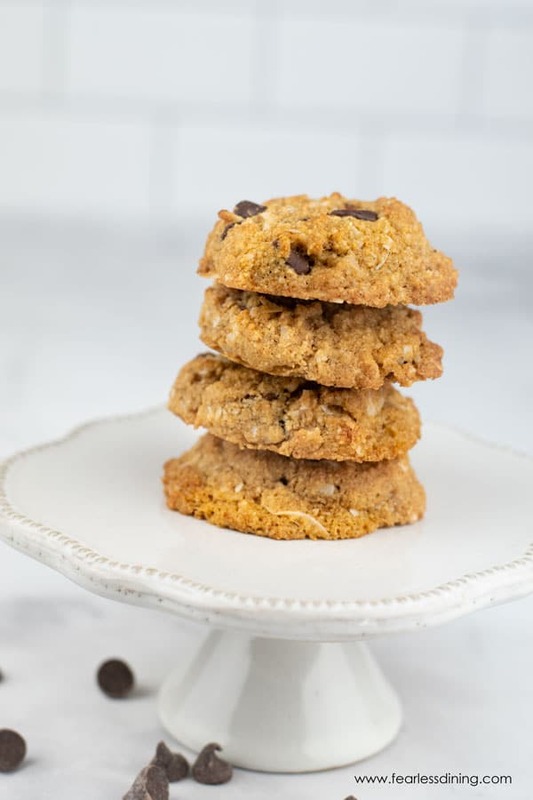 These are by far the best paleo chocolate cookies ever…coconut sugar keeps them lower glycemic, and coconut oil not only adds nutrition, but it also helps keep these cookies dairy free as well! Are you ready to see how easy these gluten free dairy free chocolate chip cookies are to make? Grab a couple of bowls and your ingredients. 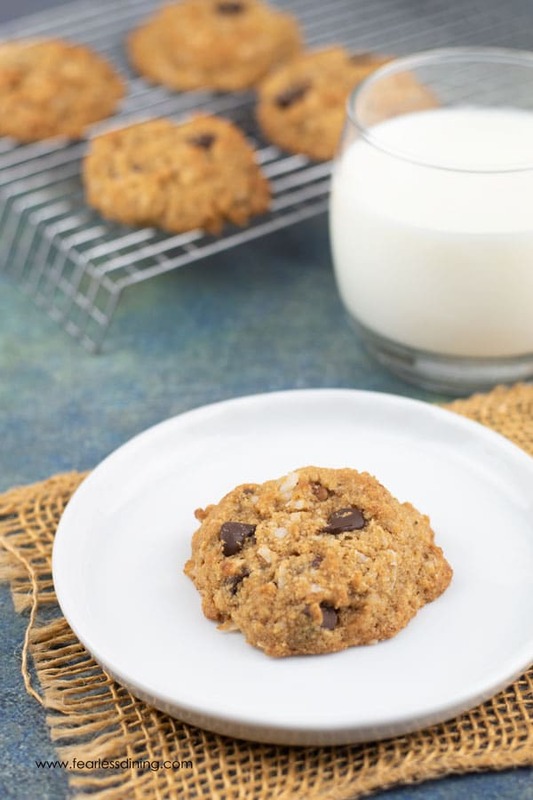 These almond flour chocolate chip cookies are so easy to make! They are also freezable, so you may want to make a double batch! 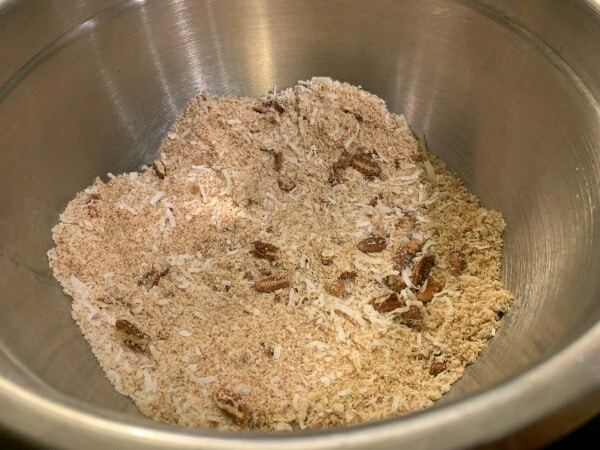 Add all of the dry ingredients into a bowl. Mix well. 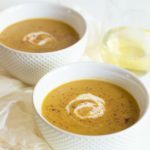 What is the best way to blend dry ingredients? My favorite way to mix dry ingredients is to use a whisk. It is important to make sure the ingredients are mixed thoroughly so the baking is even. Next, add the wet ingredients to a bowl and whisk to blend. I melted the coconut oil, then tempered the eggs so that it didn’t cook the eggs. 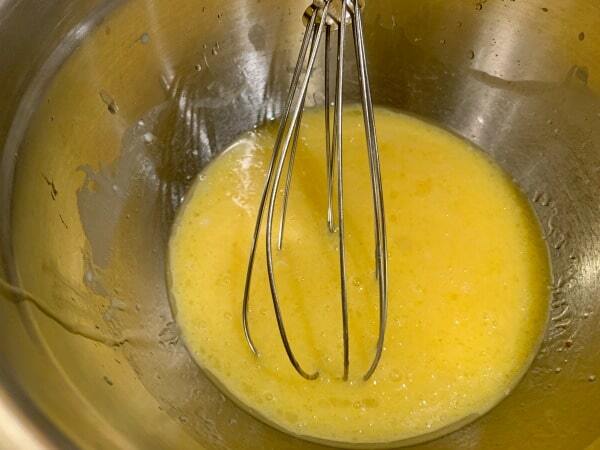 The first step to tempering eggs is to add a very small amount (1 tablespoon) of the hot liquid to the eggs. I whisk the whole time I gradually add the hot liquid. 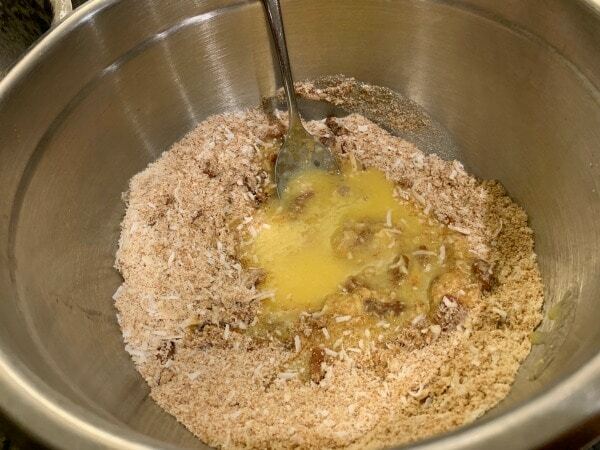 Once half of the liquid is whisked in, it is safe to add the rest of the liquid. Your cookie dough batter will look like this. Let the dough sit for 5 minutes. I use coconut flour to give these cookies some structure…almond flour by itself won’t hold up and would be very crumbly. 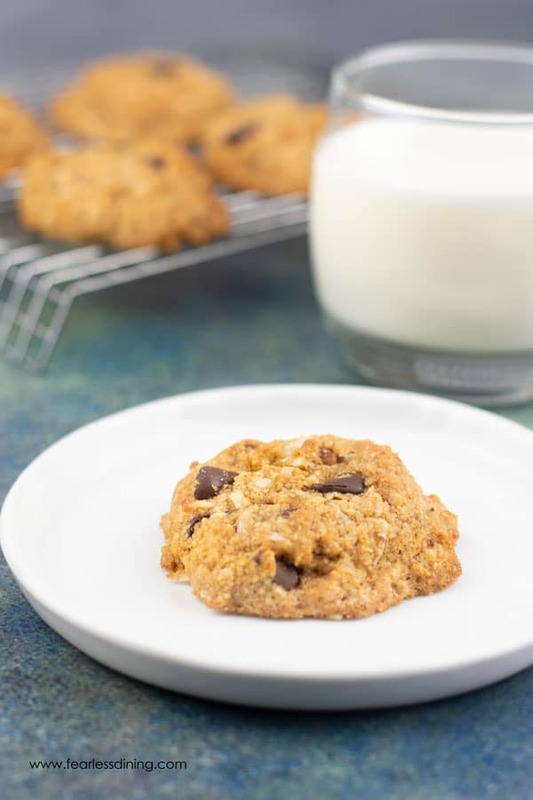 Crumbly cookies are no fun, so make sure to pick up the Organic Coconut Flour at Raley’s! 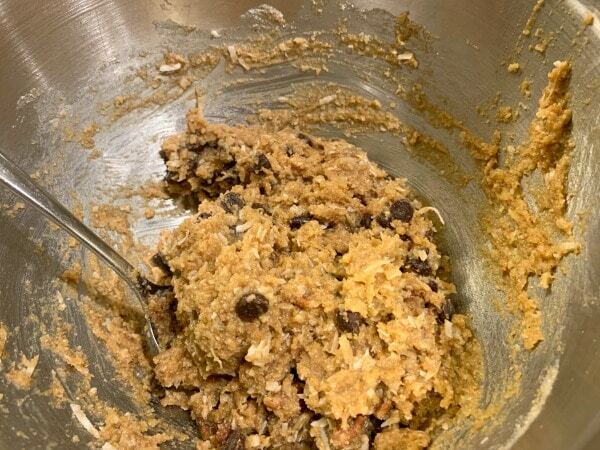 Normally I wouldn’t suggest letting cookie dough sit, but coconut flour absorbs a LOT of moisture and you want to make sure everything is absorbed before you bake the cookies. Preheat the oven to 350F degrees. Use a cookie scooper to make cookie balls and drop each onto a parchment paper lined cookie sheet. Flatten each slightly with the back of a spoon. Take them out of the oven and cool on a cooling rack. If you are like me, I like them warm when the chocolate chips are still slightly melted and gooey! A cookie scoop to make your cookies all sized the same. A cookie sheet to bake your cookies on. A delicious paleo chocolate chip cookie recipe. 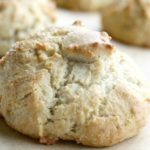 Totally grain free, and made healthier with almond flour. No refined sugars. Preheat the oven to 350F degrees. Line a cookie sheet with parchment paper. In a large bowl, add the dry ingredients. Mix well. In a small microwave-safe bowl, melt the coconut oil. Do not overheat. In another bowl, add the eggs and vanilla. You will need to temper the egg mixture so the coconut oil doesn't cook the eggs. To do this, add a tablespoon of coconut oil to the egg mixture, whisking the whole time. Add another tablespoon and repeat. Once you have added 4 tablespoons, pour the rest of the coconut oil in. 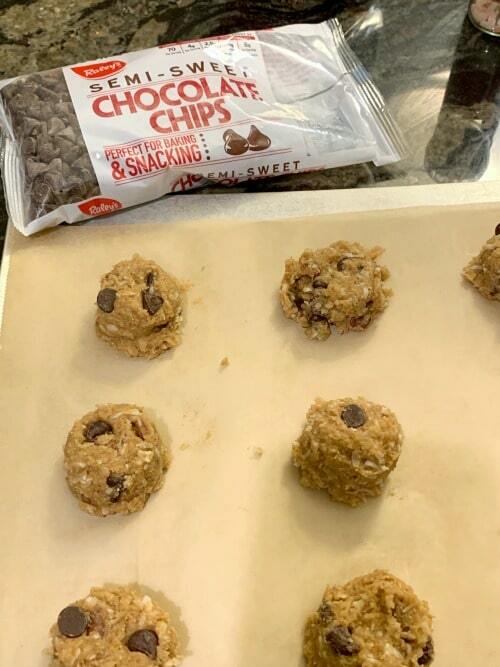 Use a cookie scoop to drop cookie dough balls onto a baking sheet. Press down slightly with the back of the scoop. Bake for 10 minutes. Remove the cookies and cool on a cooling rack. These cookies look so decadent and healthy too. Perfect! 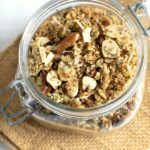 I just bought almond flour so can give this recipe a go! 🙂 Thanks for the inspiration. These look so tasty, I can practically feel the crumble! I really like cookies with almond flour – they have such a nice texture. Such interesting ingredients go into making these amazing cookies. All so healthy too. Love the idea of using Almond Flour. Will surely try. These are exactly what I need so when I eat a dozen of them, I don’t feel badly!! Ha! LOL, I could eat a dozen too! These sound great, Sandi! I love it when a market takes the time to provide a quality store brand. Well done, Raley’s! Don’t need to be Paleo or gluten free to love these cookies and I love my neighborhood Nob Hill store! I love our Nob Hill too!! They always have fun stuff. Check out the new matte dishes they have. These cookies sound incredible! I love baking with almond meal, but you’re right. These products aren’t cheap. Wish Raley’s was here in San Diego! Can’t wait to try this one AND the creamy dark chocolate custard you just loaded up. That will be for my kids – but sounds like a must try!! Please do come back and let me know how everyone likes this.